Small Business Week is coming up in October here in our home country of Canada and seeing as how small businesses are some of our most cherished customers, we wanted to do a little something to celebrate them! We know it's hard to get funding for your small businesses--looking for small business grants and loans, so we're starting a small business competition to help you out with that. We want to give back with a chance to win $10,000 in free product and free marketing. 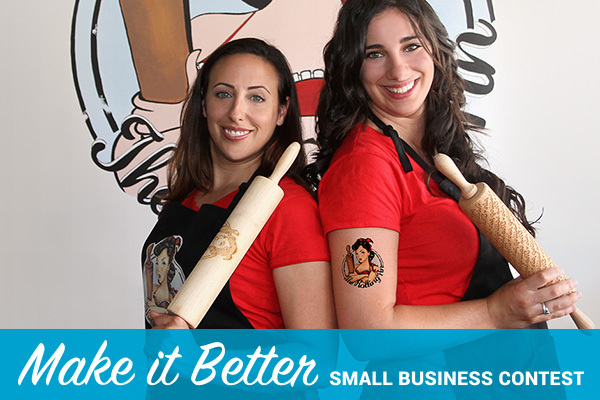 The “Make It Better” campaign is an online contest for small businesses to increase their brand visibility through a StickerYou sponsored make-over. A small business from Canada and one from the U.S. will win an amazing storefront experience through the innovative use of stickers, window and wall decals as well as product labels and more. The winner will be chosen based on a criteria of online votes, business initiative, and a panel of judges. Applications close on the 7th of September and voting will take place from the 12th to the 22nd. See the contest page for more details at StickerYou.com! This contest is more than about the custom stickers, it’s about you. The story of your business is really the story of you, the business owners. It is a story of growth and change, of struggle and triumph. And we want to hear your stories. We want to know who you are, where you came from. If you have a compelling business story, tell it to us so we can share it with the world! The small business you built is great, now remember to make it better. So, step right up and applu! And, who knows? There may be more to come.